Interesting Olympiad. No earth-shattering stories unless one thinks of Ukraine's win as a major upset. There were other major stories such as 13-year old Magnus Carlssen's appearance on board #1 for Norway. Finally, the flogging of FIDE Vice President by Spanish officials leaves one to wonder why do strong chess players keep getting beat up these days? Bobby Fischer first… now Zurab Azmaiparashvili. This Olympiad re-emphasized the "youth movement" as Ukraine was propelled to a golden performance on the broad shoulders of their leader Vassily Ivanchuk and the brawn of their youth. Sergey Karjakin turned heads and with fellow 14-year old Yuri Kuzubov "waiting in the wings," things can get scary in future Olympiads for Ukrainian opponents. Ukraine played well and certainly deserved their run at Olympiad gold. 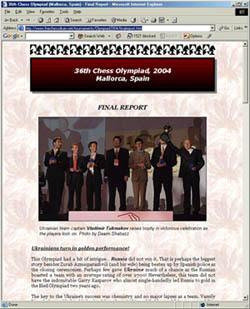 India's rise as a world power in chess was further accented in Mallorca and Cuba showed toughness as well. Good things are happening within the African Diaspora with many initiatives are taking place. There is gradual growth at many corners of the African continent to promote chess and in the Caribbean, Ian Wilkinson's new book will become the inspiration of thousands of chess aficionados.